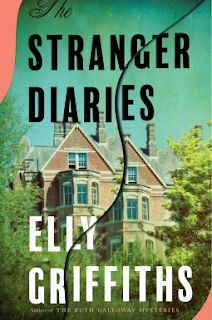 The Stranger Diaries by Elly Griffiths is a gothic cozy murder mystery with literary leanings and I really enjoyed it. The story is told from the perspective of three main characters, teacher Clare, daughter Georgie and DS Kaur. Clare is a literature teacher with a passion for the work of gothic writer R.M. Holland. Clare teaches at Holland House, Talgarth High School, the building where the reclusive R.M. Holland lived and wrote The Stranger. When Clare's friend and colleague Ella is found dead, clues seem to point to the well known ghost story by R.M. Holland, The Stranger. Set in rural England, this is a classic whodunnit with plenty of literary references. I enjoyed the alternate perspectives of daughter Georgie and DS Kaur's investigative process. The Stranger Diaries is an enjoyable cozy murder mystery with plenty of potential suspects and I enjoyed the gothic undertones and satisfying conclusion. The inclusion of the short story The Stranger at the end was a bonus. I had to look up what “cozy murder” meant. It is a term you see so often lately. Argghhh. Lightbulb. Good point May, I should have specified that it's a murder mystery but without the gore. There's a murder and sometimes multiple murders, but very little violence in a cozy mystery. It's a whodunnit more than a dark police procedural. Hope that helps and glad you enjoyed the review.